So, let’s kick off some of the shiny new content in 2.4 with a quick guide to the new daily quests. See my complete guide to the Sunwell dailies here. The Patch 2.4 Disclaimer: Until 2.4 goes live, any of this is subject to change while on the PTR. I will provide updates if I know of any changes, but I don’t guarantee I’ll catch it all. Patch 2.4 is bringing a number of new daily quests, in a few different categories. Also worth noting is the fact that the per-day limit for repeatable daily quests is being raised to 25. These quests are given by Old Man Barlo (<Master of Fishing>) at Silmyr Lake in Terokkar Forest – just to the east of Shattrath. I don’t know for sure yet, but I suspect he’s likely to provide a different fishing quest each day, like The Rokk does for cooking. Note that the fishing quest may have a skill level pre-requisite, and the fish you need to catch for it may also have a minimum skill required to fish them up. I have 375 fishing skill, so I can’t tell until my non-fishing mage alt transfers to the PTR successfully. “There’s a lot of big fish in the Zangarmarsh lakes. Ever wonder what they eat? Shrimp. Giant freshwater shrimp. The Rokk tells me the dishes you can make with shrimp are nearly endless. And the Sharpened Fish Hooks are a new lure with the same effect as Aquadynamic Fish Attractors. Bring 1 of each battleground’s Mark of Honor (AV, AB, WSG and EotS) to the questgiver. The reward: 12g and 314 honor. Now there’s a PvP daily worth doing. Edit: I stand corrected! This isn’t a daily, it’s just a repeatable quest. Get 100 of each mark before the patch and you can turn them all in on patch day for 31,400 honor and a lovely case of carpal tunnel. Now we get down to the real meat-and-drink of the new 2.4 content: the daily quests for the Shattered Sun Offensive. This new faction is working against the Burning Legion to try and keep the Sunwell safe, and is being run by the Aldor and Scryers working together. I’ll provide a more comprehensive guide to the SSO dailies once I’ve got further with the content, but in the meantime I’ll just discuss the dailies as I encounter new ones. To begin with, you start at Neutral with the Shattered Sun Offensive. There are three or four daily quests open to you. To kick it all off, though, you’ll want to get the starter quest (“Enter, the Deceiver…”) from the questgiver near A’dal in Shattrath, and head to the Isle of Quel’Danas. You’ll automatically know the flightpath once you hit a flight master in the Eastern Kingdoms; Quel’Danas is connected by flightpath to Zul’Aman (and apparently also to Silvermoon, for the Horde). This quest is given by Theris Dawnhearth at the staging area on Quel’Danas. To complete it, kill Wretched Fiends and Wretched Devourers and gather 4 Mana Remnants from their corpses, then use (right-click) the Mana Remnants on a sanctum ward (the big red floating crystals with Wretched mobs around them). Reward: 9g and 150 SSO rep. This quest is given by Vindicator Xayann at the staging area on Quel’Danas. She gives you a stack of modified golem control cores. Find and kill 3 Erratic Sentries; use the modified cores on each sentry’s corpse to reanimate it as a Converted Sentry that follows you round. Then run your three Converted Sentries to the Sun’s Reach Sanctum, and wait there until their new programming takes effect. This quest is given by Lord Torvos in Shattrath in the NE quadrant of the inner ring, nearish the flight point. The quest asks you to go to Netherstorm and get the Sunfury Attack Plans off blood elves there. Any Sunfury blood elf in Netherstorm has a chance to drop these plans; I picked mine up on my third kill near Manaforge B’naar. The quest gives you 10g, “Shattered Sun Supplies” (which is a package with some random selection of contents; mine had a BoE green plate chestpiece in it) and 250 Shattered Sun rep. The goggles let you detect “red Multiphase Disturbances” passively, and have a Use effect to take a Multiphase disturbance reading. 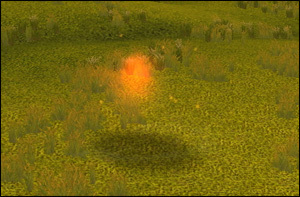 The detection effect only works in Nagrand, so don’t put the goggles on until you’re in Nagrand or you won’t get the detection buff at all (and will get very confused flying around looking for red things you can’t see). With the goggles on you’ll see the red glowy light patches; just get near one, right-click your goggles (it will dismount you, so don’t be too high up), and repeat six times with new red patches. (A reading will disperse any given Disturbance, but others in your group may also get credit for it.) Then return to Haronem for 250 rep, 10g and a “Shattered Sun Supplies” parcel. This is a gathering quest that requires you to have herbalism, mining or skinning. WoWWiki has details here, and says it gives 16g, 250 SSO rep and 2 Major Rejuvenation potions. I can’t confirm, as I’m an Alchemist/Jewelcrafter. The new pvp daily is cool though, a way to spend all those extra tokens. Nice guide, really helped me out with the atrange red floating crystal for the Sanctum Ward quest. Anyway, glad you found the guide useful! I’ll be continuining to blog about the new dailies in 2.4 as I play on the PTR more.